For the days when you can’t give your pup the attention they deserve, turn to Dogtopia of Newmarket. 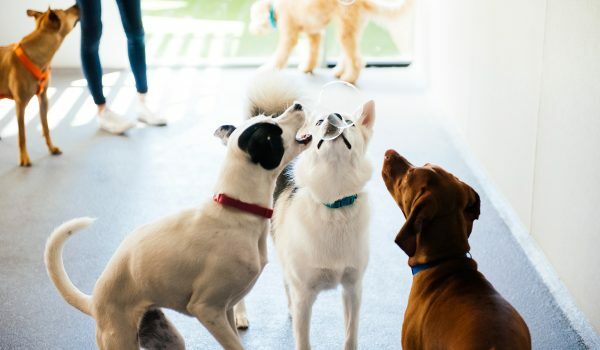 With our doggie daycare, boarding, training and spa services, we make it our mission to encourage exercise, education and socialization while ensuring your furry family member is safe and happy. At Dogtopia of Newmarket, we strive to provide a higher quality dog daycare. We want to be more than just a place to drop off your dog for the day. 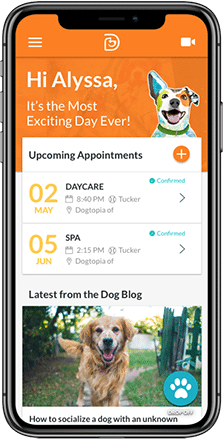 Instead, we’ll deliver a beneficial experience for your pup and provide them with the necessary socialization and education to become a well-behaved member of your family. 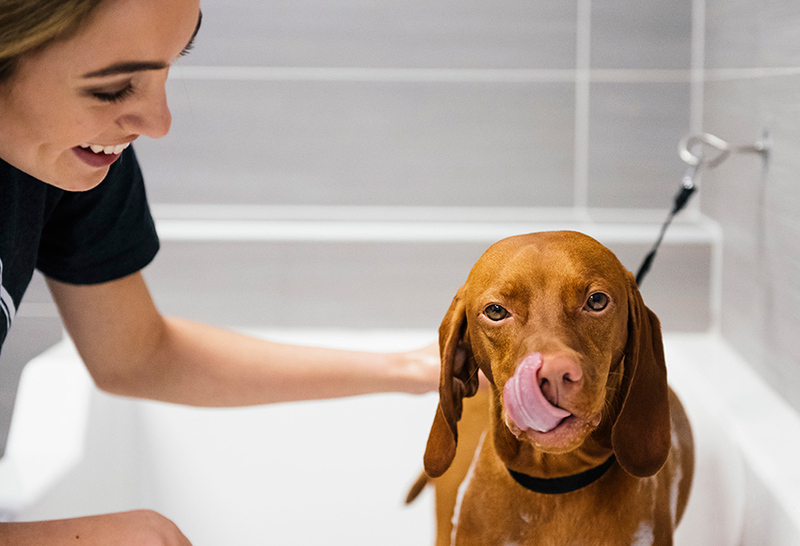 Don’t just take it from us – our pet parents love to rave about how much attention their dogs receive from our caring team of professionals, as well as the cleanliness of our spacious, well-maintained facility! Our dog daycare in Newmarket is the perfect option for pet parents who don’t want to leave their furry loved ones home alone all day. In our off-leash, open-play environment, your pup will be able to burn up all their pent-up energy in a healthy and supervised manner. Your pup will be able to socialize with other dogs, learn new things, and have fun in our safe, structured environment. 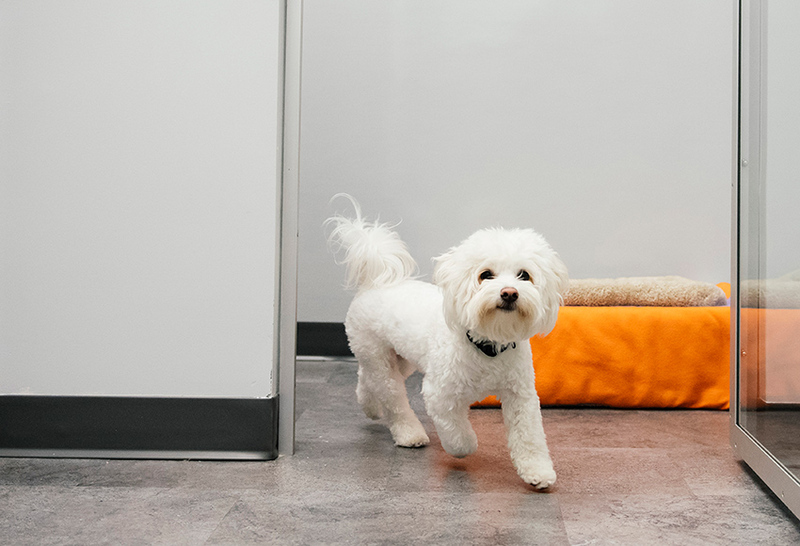 Dogs are placed in different spacious, supervised playrooms according to their size, temperament, and play style to ensure all pups are kept safe and comfortable throughout their stay. Our certified Canine Coaches will teach them valuable skills to help them socialize better with humans and other dogs. We will even keep you updated on your pup’s progress with periodic report cards, and you can always check in on the webcams whenever dogs are in open play. You also have the flexibility to choose from a half-day or full-day of daycare to fulfill your needs. Going away on vacation or business trip? Give yourself peace of mind by leaving your pup with Dogtopia of Newmarket. Our overnight and extended boarding services will give your furry family member a vacation of their own. Your pup will be able to play with their BFFFs (Best Furry Friends Forever) all day and enjoy a peaceful night, with overnight supervision on site. You can also make their stay that much better by adding a spa service. They will return home feeling squeaky clean, smelling fresh and looking like a million bones! Thinking of boarding your pup for an overnight stay or longer? We kindly request bringing them to our Newmarket location for a meet and greet ahead of time. We ask that you try to bring your dog in twice before any new boarding stay, to make their vacation as enjoyable as possible. This will help your furry friend to get acquainted with our dog-loving team and become comfortable in the new environment. Please contact us for a no-obligation tour of our facilities. We would love to meet you and your dog and show you everything we have to offer! 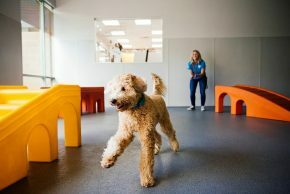 Dogtopia of Newmarket officially opened its doors to pups in the Newmarket area in November 2017 with a 6,000 square foot facility that has been custom designed with your dog’s needs in mind. 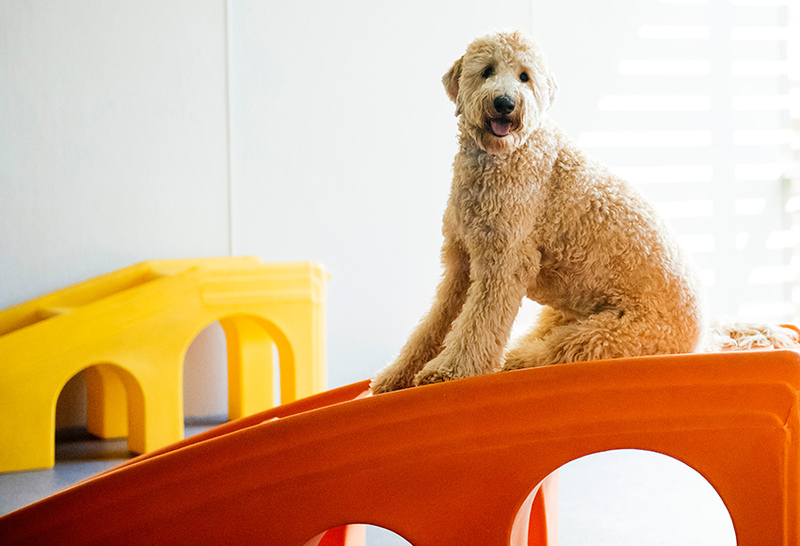 In each of our three playrooms, you will find specialized rubber flooring to keep your furry friends’ joints and paws in good health, while our HVAC brings in fresh air and maintains consistent temperatures and air quality to keep your pup comfortable. Your dog’s health and safety are our top priority, which is why we are committed to ensuring a safe and clean play environment. We have put in place a custom cleaning program that utilizes Bio-Enzymatic cleaning solutions which clean and disinfect while also offering the highest level of safety available. Our facility is outfitted with 15 security cameras, ensuring extra safety and visibility across the entire premises. Dogtopia of Newmarket is proud to serve the neighbourhoods of Newmarket, Aurora, Richmond Hill, Bradford, Barrie, Thornhill, Stoufville, Sharon, Keswick, and East and West Gwillimbury. We are conveniently located on the southwest corner of Yonge Street and Davis Drive in Newmarket. We’re only 10 minutes from Highway 400 or Highway 404 and the DVP. You can find us next to Alexanian Carpet and Flooring and Chapters, and across the street from Goodlife Fitness. We have ample customer parking in front of our facility. Going shopping at Upper Canada Mall? Drop your dog off with us first, as we’re easily located directly south of the mall. Unlike most daycare facilities in Newmarket, we offer a wide range of dog training courses to help educate your pup. Our courses include puppy training, agility training, and basic and advanced training. To inquire about our training schedule, please fill out our contact form or give us a call at (289) 401-3222. 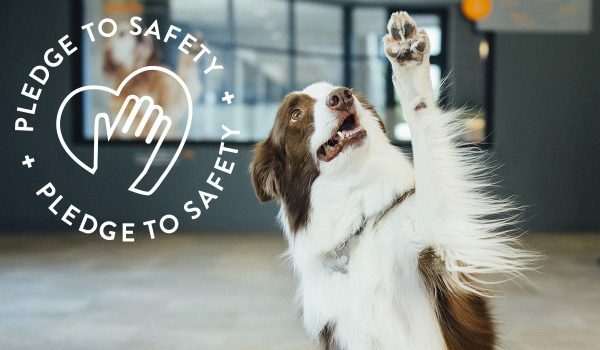 Your pup’s safety is as important to us as it is to you. You can trust that your dog is in good hands with our highly trained certified Canine Coaches. They have completed extensive training based on a curriculum designed by a registered animal behaviorist. They can recognize the subtlest dog body language, and have experience managing multiple dogs at once. Best of all, our certified Canine Coaches are there to ensure your pup is having the most exciting day ever! They will keep your pup’s brain stimulated through various play techniques and games such as follow the leader, catch, bacon-flavoured bubbles, and more. We also host monthly special events to make your dog feel special, including pool parties, Valentine’s day cupcakes, Santa pics and bubble days. If you are interested in scheduling your dog for our daycare, boarding or spa services, please contact us to arrange a time and date that works best for you. Remember, before bringing your pup for a boarding or daycare stay, we politely ask that you bring them in to our Newmarket location first for a meet and greet. This will include vaccination confirmation (DHPPL, Bordatella, and Rabies), a review of your dog’s history and health, a nose to tail assessment, and an evaluation of your dog in our open-play environment. 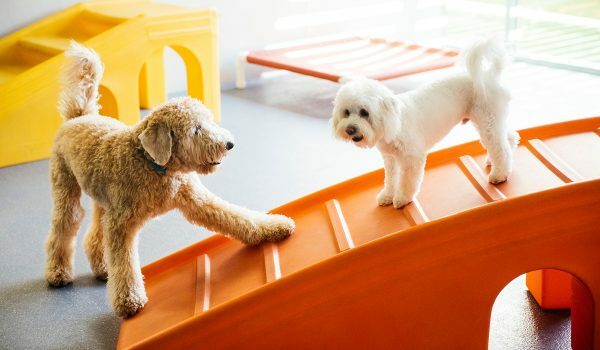 Our meet and greet will determine which playroom fits best with your pup’s play style and also gives your dog a chance to meet our dog-loving trainers and get comfortable in this new environment. If you plan on boarding your dog with us but they do not attend Dogtopia daycare dog, we recommend you enroll your pup in at least three days of daycare prior to their boarding stay, if possible. At Dogtopia of Newmarket, your dog is our top priority. We are dedicated to finding the suitable daycare, boarding and spa services that align best with your pup’s needs, as well as your own. If you have any questions, please fill out our contact form or give us a call at (289) 401-3222. Our friendly and knowledgeable team is here to assist you with any questions or concerns you may have and help you determine the best fit for your pup. Schedule your dog’s Meet & Greet today. We can’t wait to meet you and your furry family member!